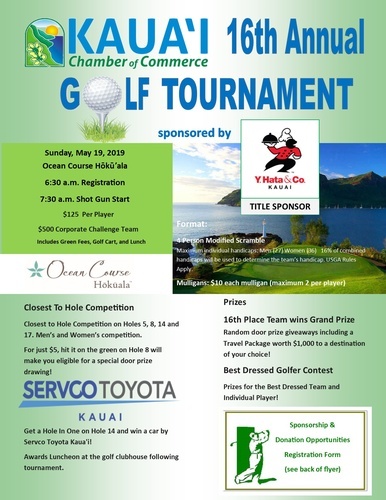 Y. Hata & Co. is the TITLE SPONSOR for the Chamber's 16th Annual Golf Tournament. Join us for a shot gun start (7:30 am) at the beautiful Ocean Course at Hoku'ala in Lihue. Maximum individual handicaps: Men (27) Women (36) 16% of combined handicaps will be used to determine the team’s handicap. USGA Rules Apply.